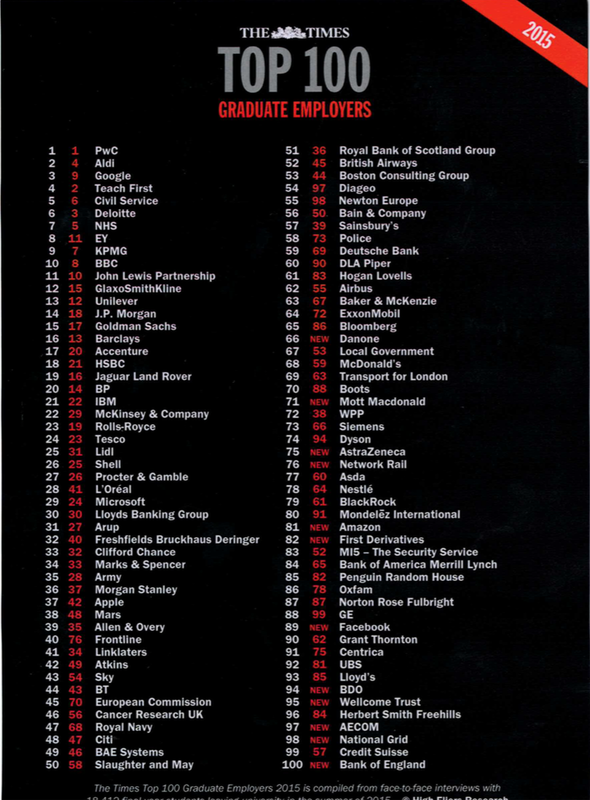 Times Top 100 Graduate Employers. Important or not? I went to HighFliers’ Times Top 100 Graduate Employers last night. As usual a very dramatic, well run event organised by the High Fliers team who deserve major congratulations. The tension in the room grew steadily as we moved through the recruitment marketing awards (more of which later), the employers of choice (again, more later), and on to the Top 100 – which were headed by PwC for the nth year on the bounce to save you looking at the list. Aldi ran them close for the first time, upsetting the accounting and public sector hegemony (still 1st, 4th, 5th, 6th, 7th, 8th & 10th), that has become the norm over the last decade. Back to the point though, I couldn’t help but wonder what makes this such a tense affair – apart from the annual personal reviews, bonuses etc that are in part determined by rankings like these, why do they actually matter? Why were the nerves jangling? There are of course reasons to knock this event. The ’employers of choice’ awards, the winners of which largely seem to remain the same over time; the marketing awards which are far more narrow than they should be (no experiential category, no judges with marketing expertise, social that seems to be better titled ‘Best Facebook page’), there are even those who doubt the efficacy of the central question that determines the Top 100 itself. But therein is the importance of last night. It may feel like the world of graduate recruitment has developed enormously since High Fliers started 17yrs ago – that it’s changed inexorably for the better – but has it? Have the people really altered that much? Probably not. As much as we’d all like to think that undergrads endlessly review and ponder on our marketing work, I suspect that they have far more interesting things to spend their time on. They have their lives to live, exams to pass, bars to visit – and that makes employer marketing of all types just so much background noise to be ignored – along with all the other commercial messaging they receive. That is until it’s time to find a job, and then a trip to the careers service – or more likely Google (ranked 3rd FYI) – to look for the best employers reveals a list of 100 great places to work. So, despite it all, for the vast majority of job seeking graduates the Times Top 100 ranking is important and that should make it important to us all too. It’s a snapshot of ever changing employer preference and visibility amongst final year students, and taken for the long-term it reflects the economic mood and the ebb and flow of industrial change. The trick is to remember that this is all it is – it is not a measure of how well we’re all doing our jobs, employers and agencies alike because the relationships we’re trying to build run far deeper than a directory, a trip to a careers service or the results of a search engine. For the full list of winners and losers, risers and fallers have a look at the HighFliers site. If you want to get our insight into how you might build your reputation, visibility and relationships with the people that you need to hire – and thereby influence your ranking, perhaps you’d be better off visiting ours.